YougoImport 9 mm Parabellum Master FLG sub-machinegun family: Master FLG is gas operated submachine gun based on “Kalashnikov” design, multipurpose use: close combat (particularly in urban areas), paratrooper operations, counter terrorist actions (including hostage rescue missions), crew personal defense (for combat and other vehicles, ships, helicopters), site and mass gathering protection as well as personal protection of the individual soldier. 9x19 mm Master FLG family consists of: - Master FLG basic version - Master FLG P version with integral silencer - Master FLG K short barreled version with finger protection handguards, without stock. Special attention has been given to safety and ergonomic details. To prevent accidental firing when the gun is dropped or bumped (which often occurs with standard blowback-operated submachine guns) this weapon fires from closed, fully locked rotating bolt; internal lever blocks the triggering mechanism if the bolt isn’t fully closed. All principle operations can be executed without moving the firing finger from the trigger guard. The gun is equipped with upper (ambidextrous) and lower magazine catch. Back during the last war in the Balkans, when the NATO intervention forced the then already privately-owned ZASTAVA ORUZJE ("Zastava Arms", formerly State-owned as "Zavodi Crvena Zastava", literally "Red Flag Mechanical Factory") to move to Athens, Greece, and rename itself as AWT (Advanced Weapons Technology, Ltd.), they developed the "Master" submachineguns series. Those weapons were: MASTER M-97: Mini-UZI copy. MASTER M-97K: Clone of the Micro-UZI, with no stock and double grip; MASTER FLG: Clone of the HECKLER&KOCH MP5-A5, with shorter barrel equipped with AK47-style flash suppressor, MP5-old-style handguard, and side-folding stock instead of collapsing stock. MASTER FLG-K: Clone of the HECKLER&KOCH MP5-K, as seen in Roger's picture. 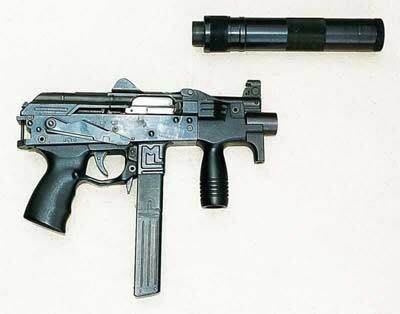 The FLG and FLG-K submachineguns were patterned after the MP5 series only in their external appearance, being them operated with an AK-style working system. All the "Master" submachineguns fed from either proprietary magazines (like the one shown in Roger's pic with the FLG-K) or UZI magazines. Them were all .9x19mm-Parabellum caliber. The purpose wasn't (surprisingly) Yugoslavian national issue but export. The concept for this weapons cache was later reprised when ZASTAVA took its name back after the AWT - ADVANCED WEAPONS TECHNOLOGY parenthesis, and the "Master" SMGs were finally introduced in several defense expos since 2001-2002, in places like Singapore, Saoudi Arabia and Brazil. There was no commercial success, whatsoever, and the designs seemed to have faded, but the weapons seem to be still manufactured under request. Them are offered through YUGOIMPORT-SDPR, the Serbian State Directorate for Trade in Defense Equipments.